With tens of thousands of cases each year, oral cancer is an increasingly common problem in the United States. This disease affects the throat, mouth, and tongue and is deadly, debilitating, and disfiguring. Caused when cells grow too much, it’s important to be regularly screened because it can help with early diagnosis, prevention, and treatment. There are several symptoms of oral cancer. All of these should be taken seriously and addressed. One of the most common symptoms is thickened skin around the various oral membranes, including your lips and gums. Additional symptoms include bleeding, numbness, loss of feeling, and a hard time eating or chewing. This disease is most commonly found in men who are fifty or older. Recent studies have shown that men are twice as likely than women to develop the disease. Additionally, lifestyle factors play a large role in whether someone will develop oral cancer or not. People who chew tobacco or smoke are at a higher risk for developing the cancer. Users of chewing tobacco are an incredible 50 times more likely to to get oral cancer. People with HPV and those who spend a lot of time in the sun are more likely to develop oral cancer. 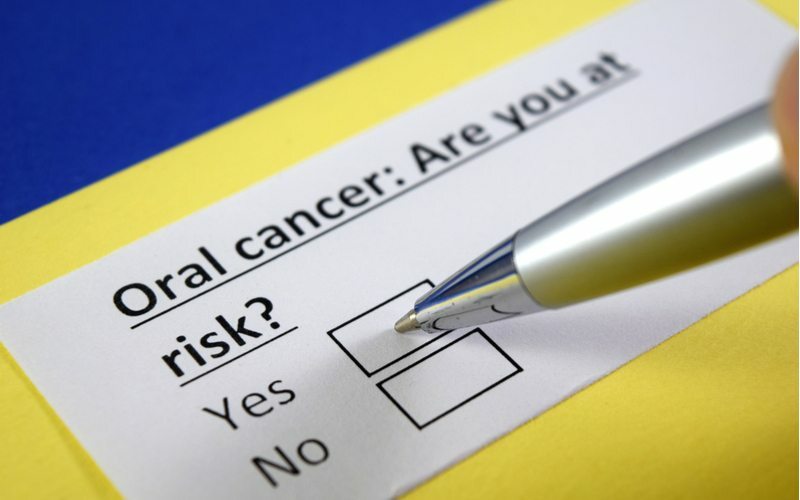 What is the survival rate for those who have oral cancer? The five year survival rate for oral cancer is 56%. This means that nearly half of people diagnosed will not survive. This is why it is crucial you’re regularly screened for the disease. Patients who are treated earlier are more likely to survive down the line. The treatment you receive will vary and be based on your unique circumstances. Oftentimes the growth will be removed and a course of chemotherapy might be prescribed if cells are remaining that weren’t removed by the removal. The best way to prevent this painful and debilitating disease is by avoiding risky behavior, living a healthy lifestyle that includes diet and exercise, and getting regular exams. We recommend patients older than twenty get screened every three years and every year once they reach 40 years. When you’re screened for oral cancer you will undergo both a physical and visual exam. During the visual exam the doctor will look at your mouth and tissues and look for anything abnormal. He will also feel for any growths around your tongue and neck. Contact our office to schedule an oral cancer screening. We are committed to early detection and treatment and are here to keep your mouth and our community cancer free.